Grey Friar is at the north-western corner of the Coniston fells, and overlooks the upper reaches of the Duddon Valley and Wrynose Bottom. Its name comes from an assocation with the Franciscan friars, who were known as the Grey Friars. Grey Friar is a super viewpoint, with interesting views in every direction, but the most impressive view by far is to the north-east, where the Scafell Range is seen along the full length of Moasdale. From here we see the entire ridge from Slight Side to the left, up to Scafell, then across Mickledore to Scafell Pike and on across Broad Crag and Ill Crag up to Great End. Grey Friars is one of those fells that is simple on the map but complex on the ground. The northern and western slopes forming a long curve sloping down to the River Duddon. The southern slopes are steeper and curve around Seathwaite Tarn and the fell has a south-western ridge that runs down to the valley and a col linking it to Great Carrs. The complexity comes from the rocky, craggy nature of the slopes themselves - there are very few open grassy areas and lots of small crags, little valleys and mini-skylines that would make this an awkward fell to descend in the dark. Grey Friar is almost pathless. There is a clear path across from Great Carrs, and fragments of path on the final climb from the south. The right-of-way coming up from Cockley Beck isn't obvious from the top. Grey Friar can be approached from two directions - either across the col linking it to Great Carrs and Swirl How in the east or up the south-west ridge (if there is a path on the lower part of this ridge I missed it!). The south-western ridge is a great route, but the walker does have to pick their own way up the slope, which is interrupted by countless crags and rocky outcroppings. This is one of those walks where you sometimes have a clear view towards the top and sometimes can only see as far as the next grassy rise or small rocky outcrop. We visit Grey Friar on our long walk that visits the Old Man of Coniston from the Duddon Valley. Grey Friar has a fairly large summit plateau, covered in boulders and with small rocky outcroppings at the very top. The south-western boundary is formed by Tarn Beck, which flows west from Seathwaite Tarn, then just before you would expect it to flow into the Duddon turns south instead. The two then run in parallel for nearly two miles, with a tongue of ricky ground between them. This long tongue of Grey Friar can be considered as one of the fell's foothills. The fell's western and northern boundaries are formed by the River Duddon. A number of becks flow down the fell to join the Duddon, with several having earned names (Dale Head Gill in the west, Cockley Beck Gill in the north west, Troughton Gill in the north. 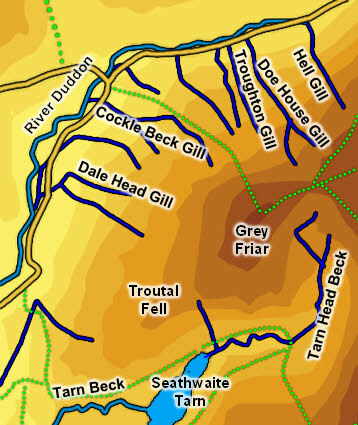 The eastern boundary is formed by Doe House Gill flowing north and Tarn Head Beck flowing south then west, both starting near the col linking Grey Friar to Great Carrs and Swirl How. Grey Friar can claim half of Seathwaite Tarn, greatly enlarged to serve as a reservoir.